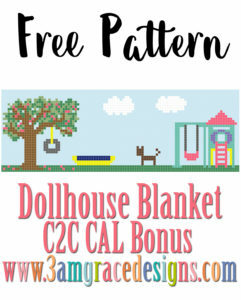 Our Dollhouse Blanket wouldn’t be complete without a backyard! I hope you enjoy the Bonus Square! Click HERE to download the Backyard graph. This panel is made using Hobby Lobby ‘I Love This Yarn’ in the following colors. The approximate yardage listed is using a 5.0mm hook and the Mini C2C method (Ch2 & 3HDC per square). If you crochet loose, use a different size crochet hook and/or a different method of squares, your yardage will be different. Happy Mother’s Day wishes to all the Mama’s!